Mending a seam is so quick and easy that it should never be a reason for tossing out your clothes. A seam will rip under stress, but that doesn’t mean that the fabric is damaged. All you need to do is replace the thread. 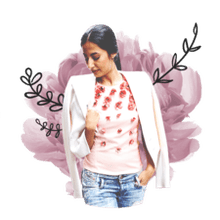 Follow these easy steps to suture your style. Gather your supplies, and you're ready to inspect the damaged seam. Turn the clothing inside-out and find the torn seam. First, you will need to assess the damage and see what needs to be re-sewn. Turn your garment inside-out and find the area on the seam that has become a hole. If your garment is surged, then you will have a lot of thread that overlaps the edges of the seams in a zigzag or looping pattern. This stitching prevents your seam from fraying during wear and washing. These threads can be removed if they are damaged. If they are not damaged, leave them alone. We are only interested in replacing the seam threads at this point. Now you are ready to tie off the loose threads. Tie off the loose threads to prevent unraveling. You will need to tie the threads off to prevent further unraveling. At each end of the opening, you should have two threads, four in all. At one end of the ripped seam, tie these two threads together snugly against the edge of the seam. Double knot it. Repeat with the threads on the other end of the torn seam. Your seam should now be tied off and there should only be a hole in the middle. You are now ready to stitch up the seam. Sew diagonally down, then across. Start by inserting your needle where the seam is still closed, about ½ an inch from where the seam has started to open. Start to sew a straight stitch above the existing seam that is still in place. Begin sewing toward the open seam. Sew a few stitches diagonally down so that you work your way to just below the original seam stitch. When you get to the open part of the seam, lay both sides of the seam together and sew in a straight line just below the old seam’s holes. It may help to use straight pins to hold the open seam together while you sew. If pins make you nervous, masking tape can be substituted by folding it over the top of the seam. Sew below the holes from the old seam thread to ensure that these holes do not show up while you’re wearing the garment. These holes should be part of the seam, not the visible part of your garment. Continue sewing in small stitches all the way to the other side of the open seam, using the old holes as a guide for a straight line. Finish up and tie off. Tie off the thread at the other side. Snip the thread about a 1/8 inch away from the knot. At the other side of the seam, sew a few stitches diagonally upward to work your way back above the original seam stitching. This should look just like the side that you started on. Using these diagonal lines will help your new seam to look natural. Tie off the thread and cut it 1/8” from the knot. 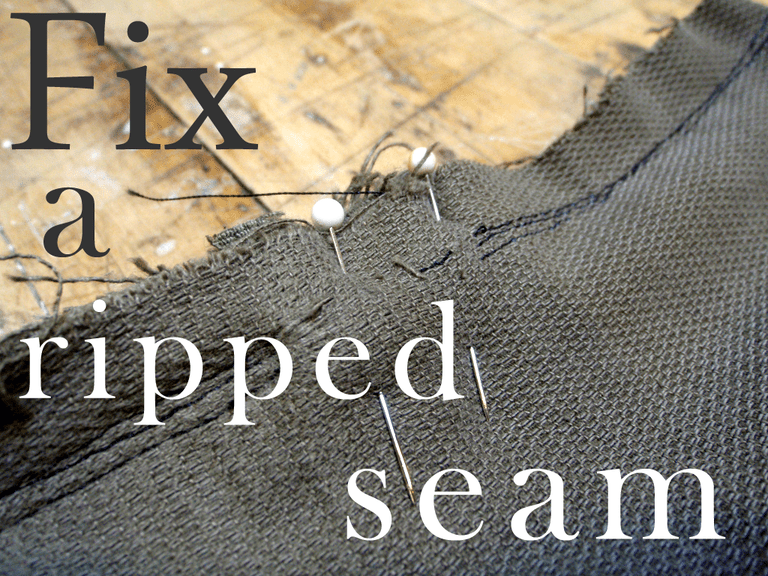 Turn the garment inside-out to see how well you’ve repaired your seam. Pressing makes all the difference. Pressing your seam can help it to look just as great as a new one, and can even conceal tiny mistakes in stitching. It takes just a few seconds and produces professional results. Before you press, make sure that the fabric is heat-friendly. Some fabrics are sensitive to heat. Read the label on your fabric for some clues. If you are concerned that it may melt, lay a towel over the fabric while you iron part of the seam to test. Do not test on part of the garment that will be visible while you’re wearing it. Remember those zigzagged or looped stitches that we talked about? These are the stitches that prevent the fabric from unraveling. If these are damaged, your seam is going to unravel over time and you’ll find yourself facing another repair. To replace, first remove all of the damaged stitching, and then replace with your best impression of a zigzag stitch. As long as you are overlapping the edge of the fabric with your zigzags, it will aid in preventing the fabric from unraveling.